Latest and greatest versions of GNOME apps on YOUR desktop! Want to run the latest GNOME applications on Ubuntu 14.04, 16.04 and 17.10? Actually, not just Ubuntu, many other distributions such as Fedora, Linux Mint and Debian that support snap. We have now packaged a pretty extensive list of the latest GNOME apps as snaps and provided them in the Snap store. Any of these snaps will work just fine on any distribution that supports snaps. These all take advantage of the GNOME 3.26 Runtime snap to keep the size down and provide the latest stable libraries needed to run GNOME applications. In a future release of snapd, installation of the runtime snap will be automatic. Once the runtime snap is installed, you can install any of the GNOME snaps with either gnome-software or from the command line just like above. 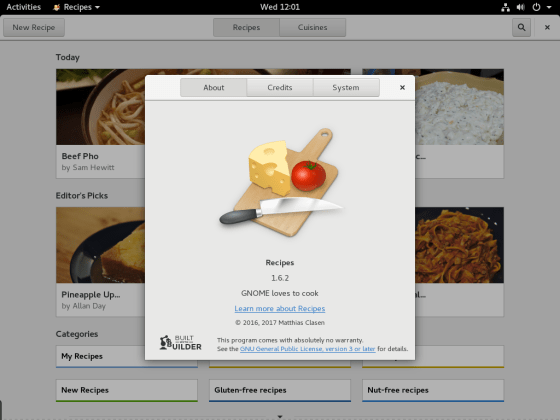 We all know GNOME loves to cook, Recipes running on Fedora installed from a snap.